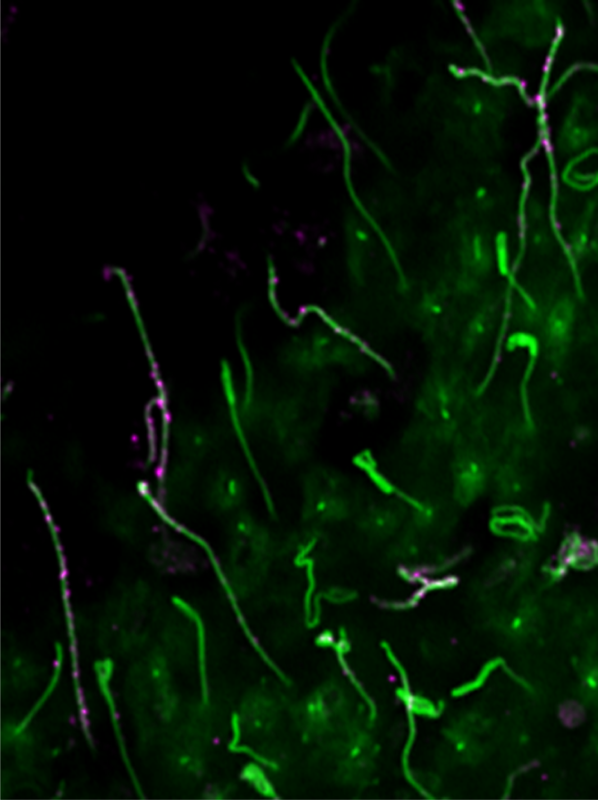 FGFR1 (in magenta) in the kinocilia (stained in green) of the utricle. This is the balance organ in the inner ear which lets you know you are traveling in an elevator. You get into a lift at the ground floor and press the button for the top: You notice a gentle tune playing and then realise you are going up. Both sets of information, that is sound and linear movement are perceived in our ears, but how do our ears sense them? It may be surprising to learn that it is just a few, highly modified cells in our inner ear that plays a vital role in maintaining balance and sensing sound. The head of the “Ear Lab” at NCBS, Raj Ladher, explains it this way: “Hearing and balance is mediated in the inner ear by specialized cells called ‘inner ear hair cells’. 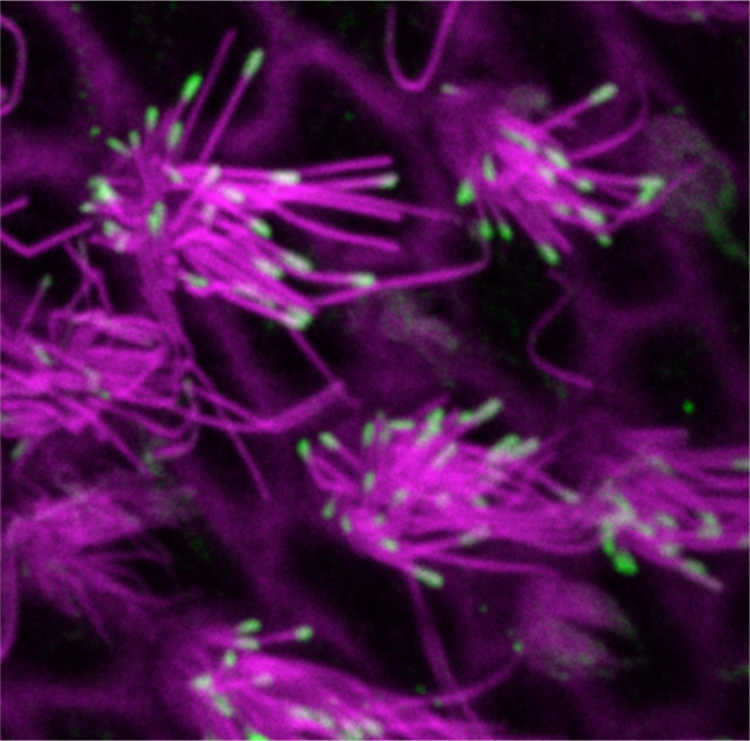 They are called ‘hair’ cells as they possess tufts of actin filaments on their apical surface. These tufts are shepherded by a structure called the kinocilium. To enable the kinocilium to do its job, it has specific sets of proteins, one of which is a protein called protocadherin-15 (Pcdh15). Pcdh15 is important for hearing and it forms the basis of some human congenital deafness syndromes”. Mice that have lost Pcdh15 show defects in development and alignment of the hair bundle of the inner ear hair cells. Raj is referring to flask-shaped hair cells of the inner ear that demonstrate a bundle of single tall kinocilium and waves of shorter stereocilia at their apex. In the study, "FGFR1 mediated protocadherin-15 loading mediates cargo specificity during IFT in inner ear hair cell kinocilia", published in the PNAS, his group found that the transport of Pcdh15 into the kinocilium of these cells involves its unique interaction with another protein, the fibroblast growth factor 1 (FGFR1), that was earlier not known to interact with Pcdh15. FGFR1 enables transport of Pcdh15 by a process of activation known as “phosphorylation”. This is the first kind of a study describing the phosphorylation modification of Pcdh15 in the current context. One of the major challenges of this study was the small size of the sub-cellular structures. This necessitated Raj’s group to utilise ex-vivo cultures of the ear hair followed by advanced microscopy. Further, as the team had identified a new pathway, they had to validate their data using a variety of experiments and model systems such as cell lines, murine cells, and cultures of cochlea. Raj describes their study with a brilliant analogy. He says, “I like to think of the transport of Pcdh15 into the kinocilia as boarding a train; there is a train that is regularly scheduled to travel to the kinocilia, but in other cells Pcdh15 isn’t allowed on. Its interaction with FGFR1 and subsequent phosphorylation is like its ticket for the ride”. Pcdh15 is also known to be intimately associated with sound reception and balance in the actin tufts of the hair cell, that are called stereocilia. In future, the Ladher group will investigate if the mechanism they identified for Pcdh15 transport in kinocilia also holds true for transport into the stereocilia.